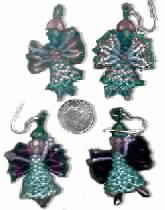 My newest project, fairy earrings These are made with 11's, crystals, Czech glass and some vintage. I want to try them in 14's next, but I need some more colors first. (Don't we all need more colors!! ) the top right is shown backwards for wing detail. I'm going to be making up some directions for these with some help from Shala (thanks Shala!) Original inspiration from Emily's site on the Mining Co, check out her site! I can make these in just about any color combo, please inquire. 1998, Childhood blues. 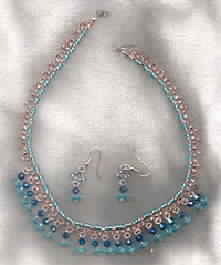 One of my favorites to wear, made from Delicas, vintage crystals and cubed crystals. 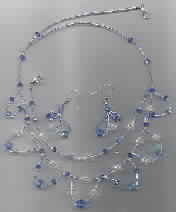 The big round blue crystals I played with as a child, I always get a good homey feeling when I wear this. 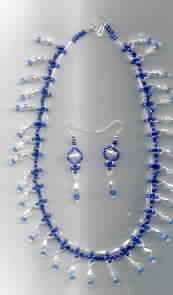 Another original design, this is a RAW (right angle weave) choker. Inspiration is actually from the movie Elizabeth. In the first couple of scenes she's wearing a wonderful lariat type necklace. I added danglies. Complete instructions are coming, but for now here's a diagram to work with. Both necklaces shown made with size 6's, czech glass, crystals and soft-flex I still can't actually weave in RAW yet, but I'm working on it, with the help of wonderful diagrams from the Moscow Bead Club site.